ST. PATRICK'S DAY WAS LAST WEEK! 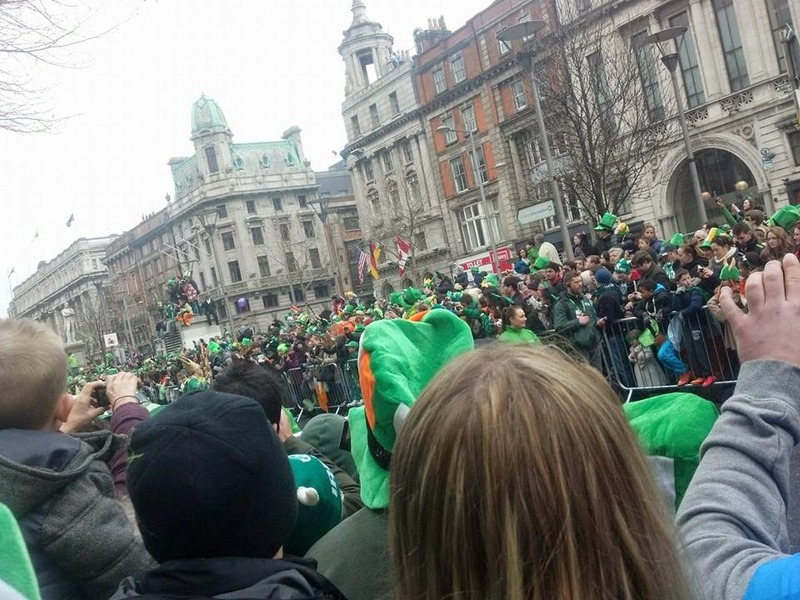 On Tuesday, we jumped on a bus and arrived in Dublin close to 11. We all know our priorities, so obviously, the first thing we did was get food. After, we tried to find a spot to watch the parade, which started at 12. We had 40 minutes to find a spot, but literally every street was packed. Completely packed. I was slightly claustrophobic, there were so many people. We couldn't make it to the front, so we hung out at the back, watching only the heads of people in the parade and the floats that were big enough that we could see them above the crowd. And what we did see, was strange. 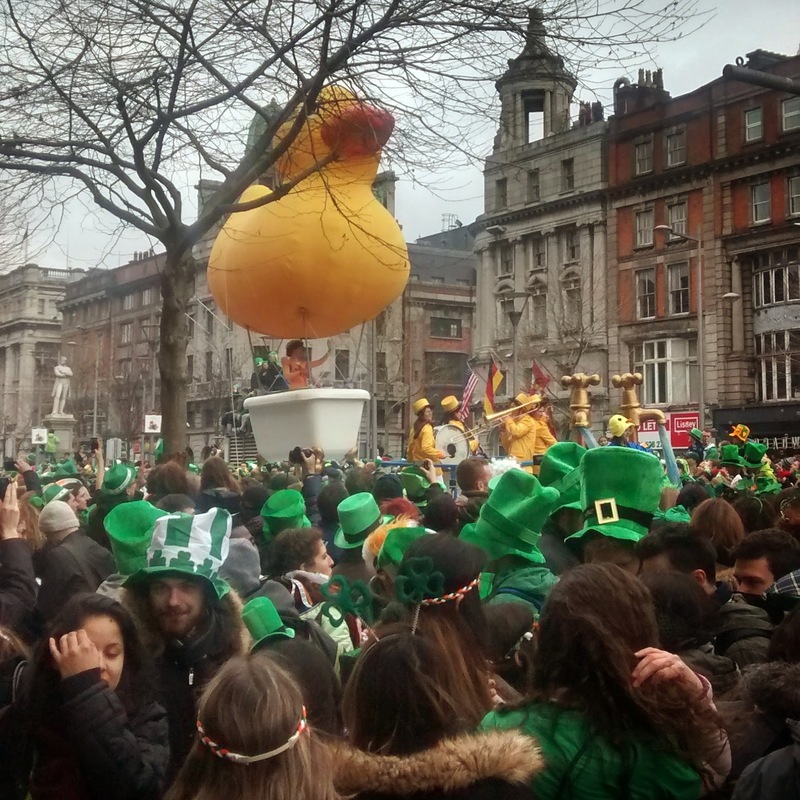 I'm not sure how any of the floats had anything to do with Ireland or St. Patrick's Day. It seemed to have a weather or an insect theme... there was a giant sun with creepy hands sticking out, a bee, a fox, a couple clouds, an owl.... I don't get it. But like I said before, Ireland sometimes just doesn't seem to make sense haha! After the parade, we wondered around and looked at Trinity College, a couple cathedrals, and the Dublin Castle. It's definitely a huge bonus that everything is within walking distance. We then found a cafe, hung out there, met up with more people, and then headed to a pub. I finally ordered my very own Guinness! Before you get excited, it was only a half pint. I'm such a wuss hahahahaha. I actually thought it would be cool to have green beer, but that was only Heineken, and that wasn't going to happen. We chilled there for almost three hours (feeling like such locals, since I'm pretty sure that's what they all do - hide in pubs to get away from all us foreigners), and then after that, went to find somewhere to get dinner. At this point it was 7pm, and we got directions to this other Irish pub that was right in city centre. Getting there however, proved to be an adventure - the streets at this point were absolutely disgusting - they were completely littered with cans and bottles. City centre was still packed with drunk people too, so it took 20 minutes just to force ourselves through the masses! Anyways, when we finally we got there, we were told it was full, so we ended up at a much less crowded Italian place. After that, we went to the Porter House (another pub haha), and stayed there until midnight, at which we then meandered our way back to the buses, to finally leave Dublin at 1am. Overall, I thought it was a really good day. 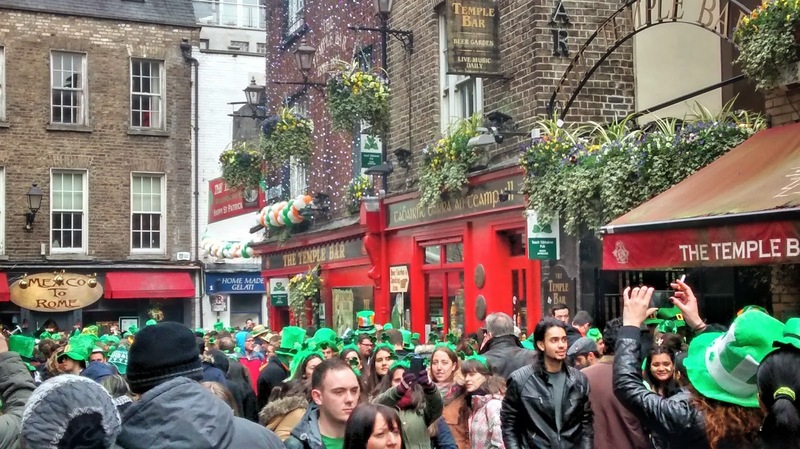 It was so cool to just revel in the fact that I was in Dublin on St. Patrick's Day!! It was just as crazy as I expected it to be, and definitely one for the books. Dublin as a city was quite different from any of the other cities I've experienced here so far as well. It seems every city has a different sort of vibe, which I like a lot. I also had my birthday on Thursday, which was both strange not to be at home for, but also very cool to celebrate in a different country!! I especially have my friends here to thank for making it such an awesome day. I came home from school, and found out Julie had decorated my door, bought a cake, and even got me this adorable necklace, since my other one broke and I've been too cheap to buy myself a replacement hahaha. I lucked out with a really great roommate :) Later that night, a group of us went out for dinner, which we have not actually done yet here in Waterford, so that was pretty cool, and then came back to the apartment for cake, and just to hang out. So nothing super crazy, and maybe not everyone's cup of tea, but definitely mine. I'm gonna miss all these people so much, but I won't think about that yet. - We had a Brazilian night where all the Brazilians made authentic food for us. It was different, but so good! - This week has been kind of ..... WARM. I'm not consistently wrapped up in sweaters and scarves! It's so exciting! This coming Saturday, the next huge adventure begins. We leave to go to London, Amsterdam, Belgium, and Paris. It's crazy to think that in a week, I'll be living out of a backpack, in a different country. Though it may not be true, I always associate those types of travellers as bold, daring, and audaciously carefree. And I don't typically think of myself as any of those. Yet here I am, about to do it anyway. It's exciting, it's scary, and it's shifting my perspective on a couple things. Like I said, anything goes in Ireland. I have no idea why there was a duck in this parade. No idea. 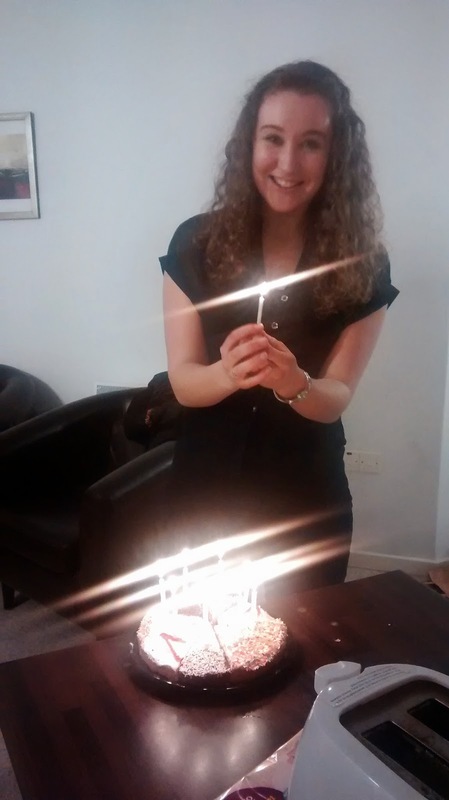 I think there were only 8 or 9 candles on the cake at this point, but we eventually crammed all 21 candles on there haha! "The aim of life is to live, and to live means to be aware; joyously, drunkenly, serenely, divinely aware."